Twitter on Monday caught wind of how specific a now year-old object recognition feature in Apple Photos can get, with users expressing concern over the system's ability to detect "brassieres." "Discovered" by Twitter user ellieeewbu, the Photos feature in question introduced at WWDC in 2016 integrates machine learning and AI technology to detect and tag faces, objects and places in user photos. The key word here is tag; no data is offloaded, no folders are created and no images are "collected." Highlighted by Quartz, ellieeewbu's concern is that Apple is saving photos of women's undergarments and creating a folder containing said pictures. The assumption is incorrect in assuming Apple saves photos (the feature analyzes pictures already in a user's album), but it is correct in noting iOS creates categories — not folders — for viewing previous Photos searches. On iOS and macOS, Photos features an AI trained to enable image searches for anything from dogs and cats to aquariums, haversacks and various sports. As noted by developer Kenny Yin in a Medium post detailing the 4,432 different scenes and objects Photos is capable of recognizing, the app can also detect facial expressions and popular locations. Apple has likely grown the list substantially since Yin first published his rundown over a year ago. 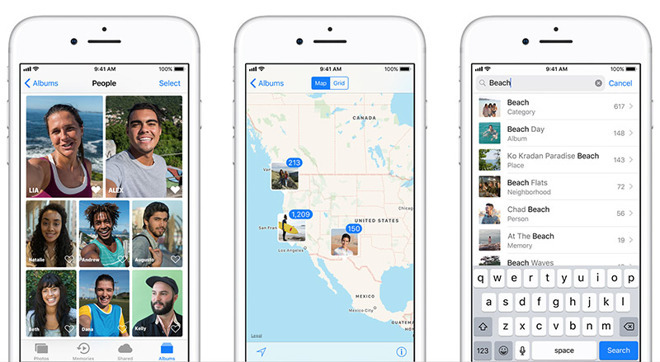 Importantly, and unlike other services like Google Photos, all photo analysis in Apple's app is performed locally, meaning no data is sent to the cloud. Thanks to machine learning technology, pictures are analyzed and — if an object, person or place is recognized — assigned metadata, enabling quick searches for "brassiere" or "brassieres" without sending picture information to an offsite processing farm. The perceived problem could stem from a user interface quirk that automatically creates categories from past searches. For example, searching for "baseball" creates an easily accessible list of photos that were deemed to include baseball themed imagery and therefore bear that metadata. These lists are not quite folders in the traditional sense, as Photos does not move images into distinct folders. Instead, Photos categories are pulled from the larger whole, in this case a user's photo album. In its own commentary, The Verge points out that Photos lacks similar search options for male undergarments like "boxers" or "briefs." Whether the exclusion is intentional or simply an oversight is unknown.